Lessons From the Praying Mantis – He Said What?! Gary and I had been out in the yard on Saturday. It was time to go in for lunch, so we called to Aaron and then headed for the house. My new mums on the front porch were vibrant with the colors of fall, and bees buzzed around lazily between the mums and my still-blooming Crepe Myrtles. It was such a beautiful day! Just as we were ready to walk inside the garage, I noticed something out of the corner of my eye. I stopped to take a closer look, not moving from where I was standing. I saw that the thing catching my attention was long and green and was perched atop my pretty Crepe Myrtle blooms, partially hidden by the growth around him. A grasshopper! An unwelcome intruder in my flower bed! I didn’t appreciate him chowing down on my Crepe Myrtle leaves, or any of my other bushes or flowers. I told Gary about the grasshopper as I stepped around to the front of the bush for better aim. I was ready to shoo that trespasser away! That’s when I realized my mistake, thankfully before I rattled the poor creature’s nerves and forced him to fly off. There sat a cute, medium-sized praying mantis. Yes, I think a praying mantis is a cute creature. Not only are they cute, but they are so very helpful in the garden. They eat the garden’s enemies and they eat some of my enemies in various bug forms, so a praying mantis is very welcome in my flower bed. I was so glad that I realized my mistake before I made him leave. Gary and I showed our praying mantis to Aaron before going on inside and leaving our little guest in peace. I’ve had similar times in my life…………….times when I’m enjoying the beauty around me in my life……….when things are bright and nice and going well. But there out of the corner of my eye I see a perceived intruder. Maybe it’s an unexpected event that is less than inviting, is even uncomfortable or causes me to struggle when I least expect it. I recently had an accident that has resulted in a shoulder injury. This injury is not only painful, but is just downright annoying as it slows me down and interrupts my sleep. Because of this injury, I have had to schedule doctor visits, an MRI, and who knows what else still to come. To top it off, we may not be able to take a special trip home that we have planned. Yet I know that God is in control of even this minor situation. This is an opportunity for me to see God’s good in the midst of my pain and disappointment…………to realize that I don’t have a destructive grasshopper perched on this branch of my life but a helpful praying mantis. God doesn’t send destructive grasshoppers into our lives, even when we wonder about the things that we’re going through. With God, His works are perfect. 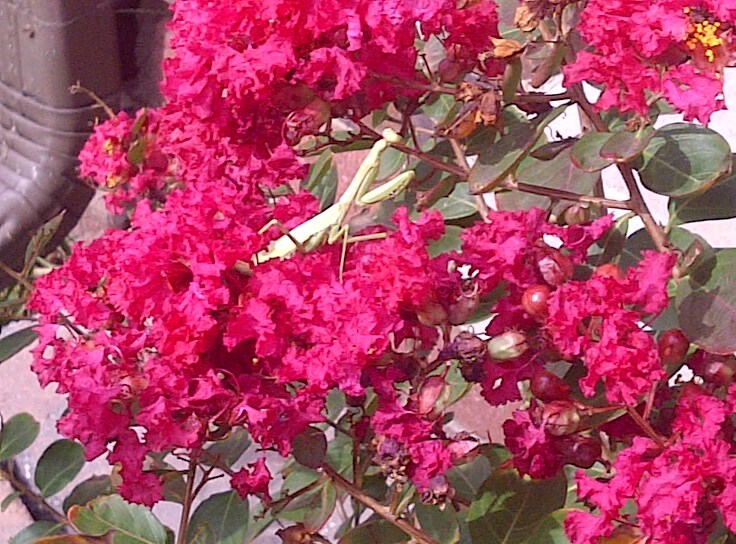 He desires to teach us and to help us, just like my praying mantis was there to help me in my flower bed. Lord, help me to take time to look at Your lessons and Your methods of teaching me before I rush in with arms flying, trying to brush off Your way of working in me. May I look with clear eyes and see these times as helpful and learning times, not times to be done away with and hurried through. Keep me still and quiet, observing Your miracles all around me and Your unusual ways of leading me. And thanks for the lesson You have taught me through this cute little praying mantis!